A stalwart of the post-war British film industry, Margaret Taylor Rutherford was a memorable character actress. Adored by her fans, she exemplified much that was lovable about the English eccentric. Her comic skill, essential 'Englishness' and general oddball character translated well from stage to screen and during her career she enjoyed some plum film roles, notably as the credulous psychic, Madame Arcati in David Lean's film adaption of the Noel Coward play, Blythe Spirit but perhaps her most famous, ongoing role was as Agatha Christie's sharp spinster detective, Miss Marple in a series of films in the 1960s. Rutherford came late to acting - she was 35 before she set foot on a stage professionally and on the wrong side of 50 when her film career began but when success hit it hit and she proved to be enormously popular with the film-going public, who appreciated her fearless individuality. In a mark of national respect she was awarded an O.B.E in 1961 and made a Dame Commander in 1967. Yet as remarkable as her late blossoming film career was, her life was just as extraordinary in other ways, unrelated to the film world. The strangeness begins with her immediate family, made all the more shocking because it is so at odds with the cheery world of tweeds, cottage gardens and cups of tea that the actress seemed eternally at home in. By the time she was born in 1893, the Rutherford family had already undergone a period of great trauma. Margaret's father, William Rutherford Benn, had sunk into a mental mire on his honeymoon and was sent to an asylum, after suffering a complete nervous breakdown. While on a break from the institution he murdered his own father, Reverend Julius Benn, by crashing a chamber pot down upon his head. Benn was subsequently sent to Broadmoor but released a few years later having evidently effected a 'cure' for his volatile mental state. Benn's brother, Sir John Williams Benn, 1st Baronet, was a prominent politician and Grandfather to Tony Benn but whether this influential connection carried any weight in Rutherford's Benn's release is unknown to this author. In any case, upon his exit from Broadmoor, Benn changed his name to Rutherford and returned to live with his first wife, Anne Taylor. However mental illness continued to intrude on his attempts at normalcy and he returned again to institutional life in 1904. In the interim he had divorced Ann and married again to a woman called Florence Nicholson . 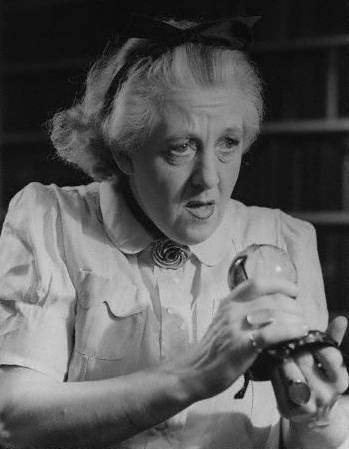 Together they had one child - Margaret Rutherford. Margaret spent her infancy with her parents in India but when she was just three years old, incredibly, tragedy again struck the family when her mother hung herself from a tree while pregnant with her second child. The young, motherless Margaret was sent to England to live with her Aunt, professional governess Bessie Nicholson. Educated at Wimbledon High, in her teenage years Margaret was sent as a border to Raven's Croft school in Seaford and in her early adult life, worked as an elocution teacher. Of course, most of this unimaginable trauma happened beyond Margaret's conscious memory but still, such extraordinary tragedy must have left its mark on the family. 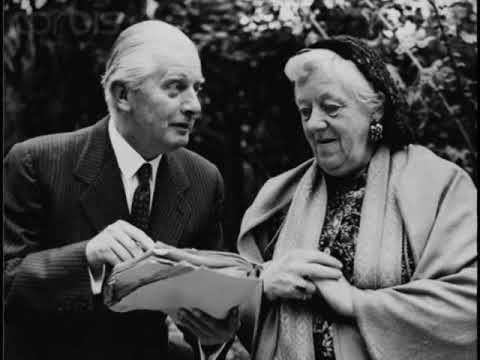 Stringer Davis and Margaret Rutherford. Rutherford was seemingly a later starter in romantic matters as well as career-wise, remaining a spinster until her marriage to fellow actor Stringer Davis at the age of fifty-two. Theirs was a close relationship, which endured until Margaret's death in 1972. The two didn't like to be apart and it wasn't uncommon for Margaret to accept a professional engagement only on the proviso that there was also a part for Stringer. Depression seems to have been an inescapable curse in the Rutherford family, as Margaret herself suffered from severe bouts of depression, necessitating shock treatment and an occasional stay in the psychiatric ward. Strange as it may seem in these days of intrusive journalism and gratuitous media expose, the press kept stum about all this and the public was none the wiser, at least during Rutherford's lifetime. It was Stringer Davis who stood by her side through all these difficulties - he was her emotional support, private secretary, general odd jobs man and took care of all her on and off set requirements. They were, in all respects, a devoted couple. There was yet another quirky twist to Margaret Rutherford's life, this time in her role as unofficial adoptive mother to writer Gordon Langley Hall, the natural child of servants at Sissinghurst Castle, the home of notorious 20s Bohemian star, Vita Sackville West. Langley was born intersex, with a condition known as ambiguous genitalia and according to Langley, was wrongly assigned at birth as male. After having spent the first thirty-one years of her life as as a man, Langley underwent reassignment surgery in 1968 changing her name legally to Dawn Langley Hall. Having met in the 60s in New York, Stringer and Margaret treated Hall as their own, offering their support and friendship in full measure. Hall, a biographer, later wrote a biography of her adoptive mother, called Margaret Rutherford: A Blythe Spirit (1983). Unfortunately Margaret Rutherford developed Alzheimers disease in her final years but at least had the full support and care of her loving husband until the end. Stringer Davis, who was six years younger than his wife, died the following year and the pair are interred side by side in the graveyard of St James Church, Buckinghamshire.